If you are used to using a keyboard and a mouse then carrying out basic tasks on an android tablet or phone will be tricky at first. Android tablets and phones use a touchscreen, and are controlled by finger gestures. There a a number of basic finger gestures that you need to become familiar with to navigate around your tablet just like you do your PC. Swiping or Dragging– Take one finger and move it along the screen in any direction. Expanding-Opposite of pinching. Place two fingers on the screen and bring them apart-used to make things larger (zoom in) . Tapping– Press on the screen in a single spot. Used for selection. Like left mouse click in windows. Long Press– Press on the screen and hold until something happens. Like right mouse click in windows. The virtual keyboard can be used in either Landscape or portrait mode. Here is a screen shot showing a typical android keyboard. You should note that the layout on your device might be different depending on android version,device model, and application that you are using. 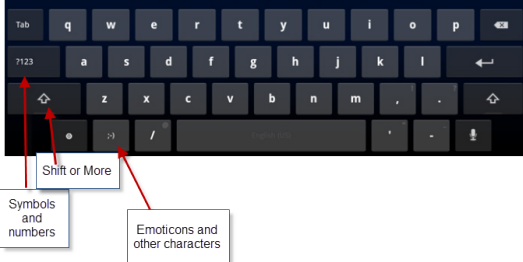 You should also note that some keys may support multiple characters. Long pressing on the key will reveal the alternative characters. 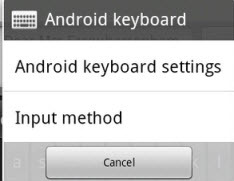 Android supports auto correction when typing you can turn this on/off and manage the settings by going to Settings>Locale & Text>Android Keyboard or Settings > Language and Keyboard > Android Keyboard. Use the shift key to access capital letters. 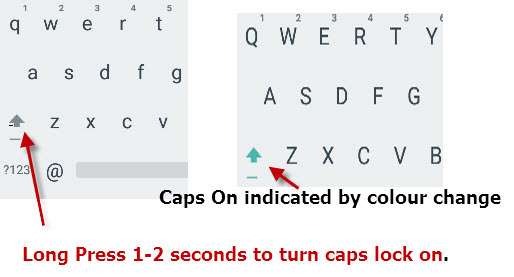 Tap once for a single capital letter long press to caps lock (may show underline on shift key to designate caps lock on) and long press again to go back to lower case. Most tablets provide predictive text and as you type you may see suggestions at the top of the keyboard. you just tap on the one that you want or if none are correct just ignore them. If you long press on a suggestion you see more suggestions which you can select from. If there are no more suggestions you should see an offer to save the word to the dictionary. 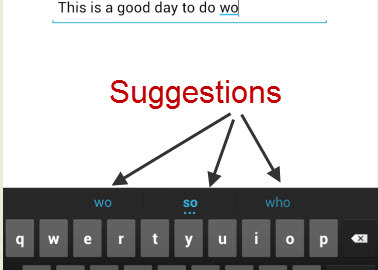 Most modern android devices support Swype typing by default, if not it can be installed as an App. Swype typing greatly improves the speed and accuracy of typing on a small keyboard. Here is a video demonstration of how it works. This video will help you navigate your tablet. It covers home screens, apps, widgets, folders and notifications. Its is done using a phone but navigating on a tablet is the same. Folders,Apps,Widgets and screen Layout etc.